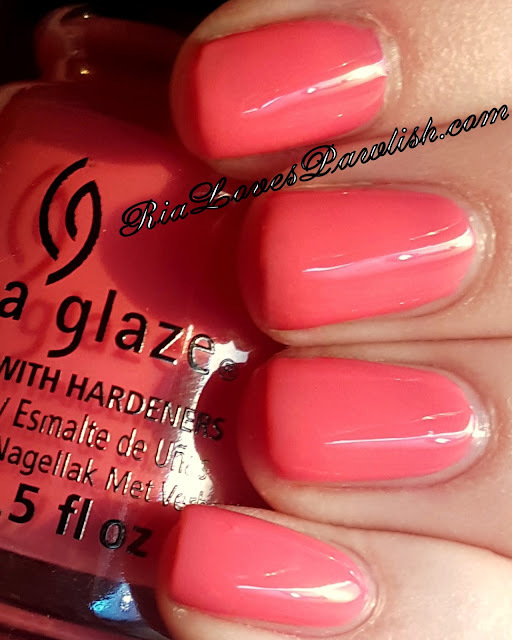 today's China Glaze House of Colour polish is About Layin' Out (it's a press sample, kindly provided to me for review)! it's a warm pink-toned coral creme... really pretty! the formula is a little tricky with this one, it's thick and doesn't dry much, so err on the side of too thin coats. i only needed two coats to get it fully opaque... but i had to redo it from my first try because it was way too thick! it dries quite glossy on its own... but because of the thickness and drying issues, i highly recommend using topcoat. two coats About Layin' Out, finished off with one coat Salon Perfect Crystal Clear Top Coat.